Menashe Avramov was messing around in the search results, like all good SEOs do, and he discovered a weird layout bug with the search results snippets in both Google and Bing around infinite ascii types of queries. He shared a screen shot or two on Google+. As you can see, the snippet ascii content curls right out of the snippet area and goes well into the results estimate. I personally cannot replicate this myself but Menashe told me it was happening for him on Windows 7 and the Firefox browser. Do you see this issue? 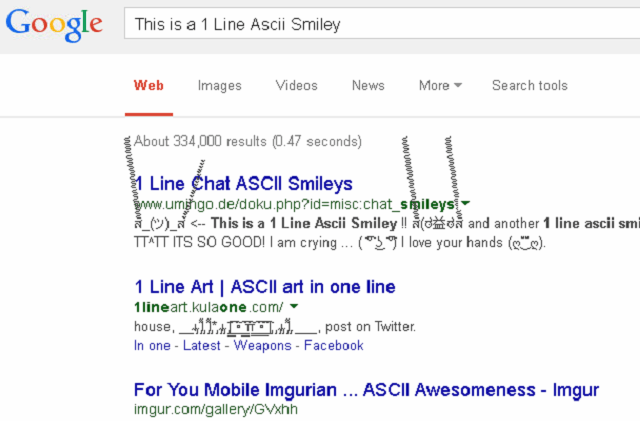 Try the query [This is a 1 Line Ascii Smiley].